Here, we present a protocol to produce an oral vaccine candidate against Type 1 diabetes in an edible plant. Santoni, M., Bertini, E., Zampieri, R., Cuccurullo, A., Commisso, M., Gecchele, E., Avesani, L. Transient Expression in Red Beet of a Biopharmaceutical Candidate Vaccine for Type-1 Diabetes. J. Vis. Exp. (145), e59298, doi:10.3791/59298 (2019). Plant molecular farming is the use of plants to produce molecules of interest. In this perspective, plants may be used both as bioreactors for the production and subsequent purification of the final product and for the direct oral delivery of heterologous proteins when using edible plant species. In this work, we present the development of a candidate oral vaccine against Type 1 Diabetes (T1D) in edible plant systems using deconstructed plant virus-based recombinant DNA technology, delivered with vacuum infiltration. Our results show that a red beet is a suitable host for the transient expression of a human derived autoantigen associated to T1D, considered to be a promising candidate as a T1D vaccine. Leaves producing the autoantigen were thoroughly characterized for their resistance to gastric digestion, for the presence of residual bacterial charge and for their secondary metabolic profile, giving an overview of the process production for the potential use of plants for direct oral delivery of a heterologous protein. Our analysis showed almost complete degradation of the freeze-dried candidate oral vaccine following a simulated gastric digestion, suggesting that an encapsulation strategy in the manufacture of the plant-derived GAD vaccine is required. Since the plant molecular biology revolution in 1980s, plant-based systems for the production of biopharmaceuticals can be considered as an alternative to traditional systems based on microbial and mammalian cells1. Plants display several advantages over traditional platforms, with scalability, cost-effectiveness and safety being the most relevant2. The recombinant product can be purified from transformed plant tissue and then administered, either parenterally or orally and, moreover, transformed edible plant can be used directly for oral delivery. The oral route simultaneously promotes mucosal and systemic immunity, and it eliminates the need for needles and specialized medical personnel. Furthermore, oral delivery eliminates the complex downstream processing, which normally accounts for 80% of the total manufacturing cost of a recombinant protein3. All those advantages can be translated into savings in production, supplies and labor reducing the costs of each dose, making the drug affordable to most of the global population. Several strategies, both for stable transformation and transient expression, were developed for the production of recombinant proteins in plants. Among them, a high-yield deconstructed plant virus-based expression system (e.g., magnICON) provides superior performance leading high yields of recombinant proteins over relatively short timescales4. Many examples of transient expression using the plant virus-based expression system in Nicotiana benthamiana plants are reported, being the gold standard production host. However, this model plant is not regarded as an edible species due to the alkaloids and other toxic metabolites that are accumulated in its leaves. In this work, we describe the comparison between two edible plant systems, red beet (Beta vulgaris cv Moulin Rouge) and spinach (Spinacea oleracea cv Industria), for the expression of two candidate forms of the 65 kDa isoform of glutamic acid decarboxylase (GAD65), carried out by the plant virus-based vectors5. GAD65 is a major autoantigen associated to Type 1 Diabetes (T1D) and it is currently under investigation in human clinical trials to prevent or delay T1D by inducing tolerance6. The production of GAD65 in plants has been extensively studied in model plant species as Nicotiana tabacum and N. benthamiana4,5,6,7. Here, we describe the use of edible plant species for the production of the molecule in tissues that can be meant for a direct oral delivery. From a technical point of view, we studied and selected the system for plant agroinfiltration and the edible plant platform for GAD65 production by evaluating different parameters: the recombinant protein expression levels, the residual microbial charge in plant tissue meant for oral delivery, the resistance of GAD65 to the gastric digestion, and the bioequivalence of the transformed plants with the wild type. Grow red beet (B. vulgaris cv Moulin Rouge) and spinach (S. oleracea cv Industria) plants in a growth chamber, using 150 µE of light intensity, 65% relative humidity, 12 h light/dark cycle at 23/21 °C, respectively. After seed germination, fertilize the plants twice a week with a 1 g/L solution of a commercially available fertilizer (Table of Materials). For agroinfiltration use five-week-old spinach and six-week-old red beet plants. Introduce the vectors - the 5’ module (pICH20111), the 3’ modules (pICH31070.GAD65mut, pICH31070.∆87G65mut and pICH7410.eGFP), prepared as previously described1,2,7, and the integrase module (pICH14011) - in Agrobacterium tumefaciens GV3101 strain using standard techniques. Grow on LB medium containing 50 μg/mL rifampicin and appropriate vector-specific antibiotics (50 μg/mL carbenicillin for pICH20111, pICH14011 and pICH7410.eGFP, 50 μg/mL kanamycin for pICH31070) for 2 days at 28 °C. Screen the colonies by colony PCR using the following specific primers for each vector: 5’-ATCTAAGCTAGGGTACCTCG-3’ and 5’-ACACCGTAAGTCTATCTCTTC-3’ for both the 3’ modules pICH31070.GAD65mut and pICH31070.∆87G65mut, with an annealing temperature of 55 °C and an elongation time of 110 s, 5’-TGAAGTTCATCTGCACCAC-3’ and 5’-ACACCGTAAGTCTATCTCTTC-3’ for the third 3’ module pICH7410.eGFP, with an annealing temperature of 53 °C and an elongation time of 30 s, 5’-AATGTCGATAGTCTCGTACG-3’ and 5’-TCCACCTTTAACGAAGTCTG-3’ for the 5’ module, with an annealing temperature of 53 °C and an elongation time of 20 s and 5’-GGCAACCGTTATGCGAATCC-3’ and 5’-GATGCGTTCCGCAACGAACT-3’ for the integrase module with an annealing temperature of 57 °C and an elongation time of 45 s.
Carry out the PCR reaction in a total volume of 20 μL using the following specific reaction cycle: 5 min initial denaturation at 95 °C, 35 cycles of 30 s at 95 °C, 30 s at the annealing temperature and the elongation step at 72 °C (annealing temperature and elongation time are specific for each primer couple) and a final elongation step of 7 min at 72 °C. Inoculate the three A. tumefaciens transformants in 50 mL of LB medium containing 50 μg/mL rifampicin and the following appropriate vector-specific antibiotics: 50 μg/mL carbenicillin for A. tumefaciens transformed with pICH20111, pICH14011 or pICH7410.eGFP, or 50 μg/mL kanamycin for A. tumefaciens transformed with pICH31070. Grow by shaking overnight at 28 °C. Pellet overnight bacterial cultures by centrifugation at 4,500 x g for 20 min and resuspend them in 100 mL (or two volumes of the initial bacterial culture) of infiltration buffer containing 10 mM 4-morpholineethanesulfonic acid (MES; pH 5.5) and 10 mM MgSO4, without considering the OD600. Incubate the suspensions at room temperature (RT) for 3 h.
Mix equal volumes of bacterial suspensions containing one of the three modules, GAD65mut, ∆87GAD65mut or eGFP 3’ module, with 5’ module and integrase module. Use the suspension mix for syringe infiltration of red beet and spinach leaves. Place 5 mL of the suspension in a syringe without the needle. Press the tip of the syringe against the underside of the leaf for both spinach and red beet plants, and meanwhile apply a gentle counterpressure to the other side of the leaf. Infiltrate the first three completely expanded leaves starting from the apex for each plant. Label the agroinfiltrated leaves with a paper tag on the leaf stem. Return the plants in a growth chamber under standard conditions. NOTE: For health and safety reasons, wear eye protection and gloves during infiltration process. Collect agroinfiltrated leaves from 4 to 14 days post infection (dpi) and freeze them in liquid nitrogen. Store plant tissue at -80 °C. Grow separately the three A. tumefaciens transformants in 50 mL of LB medium containing 50 μg/mL rifampicin and appropriate vector-specific antibiotic by shaking overnight at 28 °C. Pellet overnight bacterial cultures by centrifugation at 4,500 x g for 20 min. Resuspend the pellet in 1 L of infiltration buffer to an OD600 of 0.35 and incubate the suspensions at RT for 3 h.
Add 0.01% v/v of the detergent (polysorbate 20) to each suspension. Mix equal volumes of bacterial suspensions containing one of the three modules, GAD65mut, ∆87GAD65mut or eGFP 3’ module, with 5’ module and integrase module. Insert one plant (six-week-old red beet plant, see section 1) in the holder. Invert the holder and place on top of a beaker containing the infiltration bath (2 L) to submerge the leaves in the infiltration suspension. NOTE: Ensure that all the leaves are completely dipped in the bacterial suspension. Raise the level with the addition of extra infiltration suspension if required. Transfer the infiltration bath with the submerged plant to the infiltration chamber and close it. Turn on the vacuum pump and open the vacuum intake valve on the infiltration chamber. Once the pressure in the infiltration chamber has reduced to 90 mbar, keep the vacuum for 3 min. Release the vacuum for 45 s. Once the infiltration chamber has returned to atmospheric pressure, open the chamber and remove the infiltrated plant from the bacterial bath. Return the plants in a growth chamber under standard conditions. Collect agroinfiltrated leaves at the maximum expression dpi, depending on the recombinant protein, and freeze them in liquid nitrogen. Store plant tissue at -80 °C. Grind the syringe or vacuum infiltrated red beet and spinach leaves, collected in steps 2.2.6 and 2.3.8, to fine powder in liquid nitrogen using mortar and pestle. Transfer the powder into 15 mL plastic tubes and store the material at -80 °C. Add 900 µL of extraction buffer (50 mM sodium phosphate pH 8.0, 20 mM sodium metabisulphite) to 300 mg of leaf powder. NOTE: The selected ratio between plant tissue weight (mg) to buffer volume (µL) is 1:3. Homogenize the mixture by vortexing for 1 min, then centrifuge at 30,000 x g for 40 min at 4 °C. Collect the supernatant in a clean tube and store it at -80 °C. Load 100 µL of each TSP extract obtained from eGFP expressing leaves, in three technical replicates, on a 96-well plate. Put the 96-well plate in a fluorescence reader and start the measurement. Use the 485/535 nm filter set required for eGFP fluorescence detection. For the absolute quantification, in the same plate prepare a calibration curve loading different quantities (62.5, 125, 500, 750 and 1,000 ng) of a purified eGFP. Mix 50 parts of Reagent A (Table of Materials) with 1 part of Reagent B (Table of Materials). Prepare sufficient volume of fresh BCA working solution for the samples to be assayed and the calibration standards. NOTE: The volume of BCA working solution required for each sample is 1.9 mL. For the standard procedure with 9 standards (including a blank), 17.1 mL of BCA working solution is required. Pipette 0.1 mL of each standard (including a blank), and TSP extracts into a labelled tube. NOTE: As calibration standards, prepare a fresh set of bovine serum albumin (BSA) standards in the 10-1,000 μg/mL range, preferably using the same diluent as samples, such as water. The blank consists of 0.1 mL of the diluent used for calibration standard and sample preparation. Add 1.9 mL of BCA working solution and mix thoroughly. Cover the tubes and incubate at 37 °C for 30 min. Cool the tubes to RT. Measure the absorbance at 562 nm of all the samples within 10 min. NOTE: Even at RT, the color development continues. No significant error will be introduced if the absorbance measurements of all tubes are done within 10 min. Subtract the 562 nm absorbance value of the blank from the readings of the standards and the TSP extracts. Plot the blank-corrected 562 nm reading for each standard on its concentration. Determine the protein concentration of each TSP extract. Perform Coomassie gel staining as previously described in Gecchele et al.8. Perform the western blot analysis as previously described in Gecchele et al.8. After the electrophoretic separation of proteins, transfer them onto a nitrocellulose membrane using standard techniques. Prepare the blocking solution by mixing 4% milk in phosphate-buffered saline (PBS) pH 7.4. Block the membrane with 10 mL of the blocking solution at RT for 1 h.
Prepare the rabbit primary antibody at 1:10,000 for the anti-GAD65/67 and anti-LHCB2, and at 1:20,000 for the anti-eGFP in 5 mL of blocking solution with 0.1% detergent. Incubate the membrane with the prepared primary antibody solutions overnight at 4 °C or for 4 h at RT with constant agitation. Discard the primary antibody and wash the membrane 3 times for 5 min each with blocking solution containing 0.1% detergent. Prepare the horseradish peroxidase (HRP)-conjugate anti-rabbit antibody at 1:10,000 in blocking solution with 0.1% detergent. Incubate the membrane for 1.5 h at RT with constant agitation. Discard the secondary antibody and wash the membrane 5 times for 5 min each with PBS-T (PBS supplemented with 0.1% detergent). Incubate the membrane with a commercially available luminol solution following the manufacturer’s instructions. Detect the signal using a chemiluminescence imaging system. Harvest the vacuum agroinfiltrated ∆87GAD65mut-expressing red beet leaves at the expression peak (11 dpi) and freeze them in liquid nitrogen. Lyophilize the frozen leaves for 72 h at -50 °C and 0.04 mbar. Store them at -80 °C. Grind the leaves to fine powder and store it at RT in a sealed container with silica gel to exclude the moisture. Weigh 100 mg of grinded freeze-dried red beet leaves and resuspend it in 6 mL of PBS (pH 7.4). Adjust the sample pH to 2 with 6 M HCl. Add 4 mg/mL pepsin from porcine gastric mucosa in 10 mM HCl to obtain a final pepsin concentration of 1 mg/mL or a ratio of 1:20 to total soluble proteins. Shake the sample at 37 °C for 120 min. Adjust the samples to pH 8 with 1 M NaOH to inactivate the pepsin. Centrifuge 750 µL aliquots of each sample at 20,000 x g for 20 min at 4 °C. Collect separately the supernatant and resuspend the pellet in one supernatant volume of loading buffer (1.5 M Tris HCl, pH 6.8, 3% SDS, 15% glycerol, and 4% 2-mercaptoethanol). NOTE: For health and safety reasons, wear gloves and work under fume hood for sample preparation. Analyze both the supernatant and the resuspended pellet by western blot analysis8. Prepare two samples of 100 mg of grinded freeze-dried red beet leaves and resuspend both in 6 mL of PBS (pH 7.4). Adjust the pH of only one sample to 2 with 6 M HCl. Shake both samples at 37 °C for 120 min. Centrifuge 750 µL aliquots of each sample at 20,000 x g for 20 min at 4 °C. Collect separately the supernatant and resuspend the pellet in one supernatant volume of loading buffer. Analyze both the supernatant and the resuspended pellet by western blot analysis. Weigh 100 mg of freeze-dried red beet leaves. Resuspend the powder in 8 mL of sterile PBS (pH 7.4) and vortex for 1 min. Prepare the LB medium without antibiotics or containing (i) 50 µg/mL rifampicin, (ii) 50 µg/mL each of rifampicin and carbenicillin, (iii) 50 µg/mL each of rifampicin and kanamycin, or (iv) 50 µg/mL each of rifampicin, carbenicillin, and kanamycin. Plate 1 mL of each freeze-dried leaf homogenate in one of the 5 selective LB media. Incubate all the plates for 3 days at 28 °C. Count the Agrobacterium colonies grown on each plate. Calculate and define the residual bacterial charge as the number of colony forming units (CFU) per mL of the freeze-dried leaf homogenate (CFU/mL). Weigh 30 mg of -80 °C stored, vacuum agroinfiltrated ∆87GAD65mut-expressing red beet leaf powder in a 2 mL plastic tube. Add 750 µL of cold 70/30 (v/v) methanol/chloroform and vortex for 30 s. Incubate at -20 °C for 2 h.
NOTE: All the solvents and additives must be LC-MS grade. Add 600 µL of cold water and centrifuge at 17,900 x g at 4 °C for 10 min. Collect and transfer the upper hydroalcoholic phase into a new 2 mL tube. Discard the lower chloroformic phase and the interphase. Put the samples into a vacuum concentrator for 3 h to evaporate the solvents. Dissolve the pellet obtained from step 7.1.4 in 300 µL of 50/50 (v/v) acetonitrile/water and sonicate the samples for 3 min. Pass the solutions through 0.2 μm membrane filters and put them into a transparent fixed 300 µL insert glass tubes. Weigh 300 mg of -80 °C stored, vacuum agroinfiltrated ∆87GAD65mut-expressing red beet leaf powder in a 15 mL plastic tube. Add 3 mL of methanol, vortex for 30 s, and sonicate at 40 kHz for 15 min. Centrifuge the samples at 4,500 x g at 4 °C for 10 min and transfer the supernatants into new 15 mL tubes. Dilute 100 µL of extract 1:3 (v/v) with water and pass the solution through a 0.2 μm membrane filter. Put the solution into a transparent fixed 300 µL insert glass tube. Weigh 200 mg of -80 °C stored, vacuum agroinfiltrated ∆87GAD65mut-expressing red beet leaf powder in a 15 mL plastic tube. Add 200 µL of water and then 2 mL of methanol, and then keep on ice for 1 h.
Vortex for 30 s and sonicate at 40 kHz for 15 min. Centrifuge the samples at 4,500 x g at 4 °C for 25 min. Collect and transfer the chloroform phase into 2 mL tubes. Discard the upper hydroalcoholic phase and the interphase. Put the samples into a vacuum concentrator for 3 h to evaporate the solvent. Dissolve the pellet obtained from step 7.3.5 with 600 µL of methanol. Dilute 100 µL of extract 1:5 (v/v) with methanol and pass the solution through a 0.2-μm membrane filter. Set up the LC-MS system as recommended by the supplier. NOTE: The LC section consists of an autosampler coupled with HPLC equipped with a C18 guard column (75 x 2.1 mm, particle size 5 µm) in front of a C18 column (150 x 2.1 mm, particle size 3 µm) for the analysis of secondary metabolites and polar lipids, whereas with a HILIC guard column (7.5 x 2.1 mm, 3 µm) in front of an HILIC column (150 x 2.1 mm, particle size 2.7 µm). The MS is an ion trap mass spectrometer provided with either an electrospray ionization (ESI) or an atmospheric pressure chemical ionisation (APCI) sources. Prepare the appropriate solvents for the HPLC gradients. For primary metabolite analysis, use 20 mM ammonium formate as solvent A; 95% acetonitrile, 5% water plus 10 mM ammonium formate as solvent B. For secondary metabolite analysis, use water plus 0.05% formic acid (A) and acetonitrile plus 0.05% formic acid (B). For polar lipid analysis, use water plus 0.05% formic acid (A) and 100% acetonitrile (B). NOTE: The solvents and additives must be LC-MS grade. Use the gradients reported in Table 1 for metabolite elution. Set the flow rate at 0.2 mL/min. Inject 10 µL of each sample for both secondary metabolites and polar lipids, whereas inject 5 µL for primary metabolites. Prepare a quality control (QC) sample by mixing equal portions of different samples to have a representative mixture of each experimental condition. Analyse the QC sample during the experiment to monitor instrument efficiency. Specifically, insert a QC sample analysis after each 10 sample-batch. Randomize the samples to avoid instrument-driven effects. After 9 analyses, insert a column cleaning method and a blank analysis immediately after. NOTE: Perform a slow gradient between the two solvents with an isocratic elution at high percentage of the strongest solvent. The blank consists of an injection of a pure methanol: water (50/50, v/v) to improve retention time reproducibility in the following analysis. Set up the instrument to acquire mass spectra in alternate positive and negative ionization modes using the parameters listed in Table 2. NOTE: Other parameters depend on the specific platform. Perform the next data processing as explained in Dal Santo et al.9. In this work, the workflow for the development of an oral vaccine in edible plant tissues is presented. The focus of this work is the expression of a target protein in an edible host plant species and the characterization of the potential oral vaccine. The first step involved the evaluation of the suitability of the plant virus-based expression technology to produce recombinant proteins in edible plant systems. For this aim, we first use the eGFP as a model protein and we expressed it into two edible leafy plant systems: red beet and spinach. Plants were manually agroinfiltrated with suspensions of A. tumefaciens carrying eGFP recombinant expression vectors. The fluorescent protein expression was visualized by western blot analysis (Figure 1A,B,D,E) and quantified under UV light. Results showed that the red beet system is characterized by a higher eGFP expression, reaching 544.9 ± 10.9 µg/g of fresh leaf weight (FLW) at 9 dpi (Figure 1C), than the spinach, which maximum eGFP levels (113.4 ± 0.3 µg/g FLW) were measured at 11 dpi (Figure 1F). For these reasons red beet was selected as expression host for all subsequent experiments. According to Chen et al.10, the eGFP transient expression was tested by a vacuum method for infiltration, which is more suitable for the large scale vaccine production. Different dilutions of the overnight A. tumefaciens culture, ranging from 10-1 to 10-3, and different concentrations of detergent (0.005-0.05%) have been tested by comparing the eGFP accumulation level at the maximum expression dpi (9 dpi). The results found that higher bacterial titers produced greater eGFP yields (10-1 ~ 0.35). However, no significant differences were found using different detergent concentrations (data not shown). Then, plants were vacuum infiltrated with an A. tumefaciens suspension at 0.35 OD600 and 0.01% of detergent. Once the expression platform and the delivery system were established, the expression of two forms of GAD65, GAD65mut and a N-terminally truncated form (∆87GAD65mut), was compared at the day of maximum expression, 5 and 11 dpi, respectively, as previously established11. After the TSP extraction from agroinfiltrated leaves, all samples were analyzed by western blot and the recombinant protein was relatively quantified by a densitometry analysis (Figure 2). Results highlighted the 20-fold higher performance of the ∆87GAD65mut form over the GAD65mut. The truncated form was therefore selected as preferred oral vaccine candidate, accumulating as high as 201.4 ± 29.3 µg/g FLW in red beet leaves at 11 dpi. Finally, parameters for the development of a potential oral vaccine were evaluated. The recombinant protein integrity after freeze-drying of vacuum infiltrated red beet leaves expressing ∆87GAD65mut was assessed in comparison with the untreated (only frozen) tissue, by western blot analysis. As shown in Figure 3A, the target protein demonstrated to be stable after the lyophilization process. The simulation of gastric digestion was carried out on the freeze-dried material by adding porcine gastric enzyme pepsin to a final concentration of 1 mg/mL or at a ratio of 1:20 to TSP. 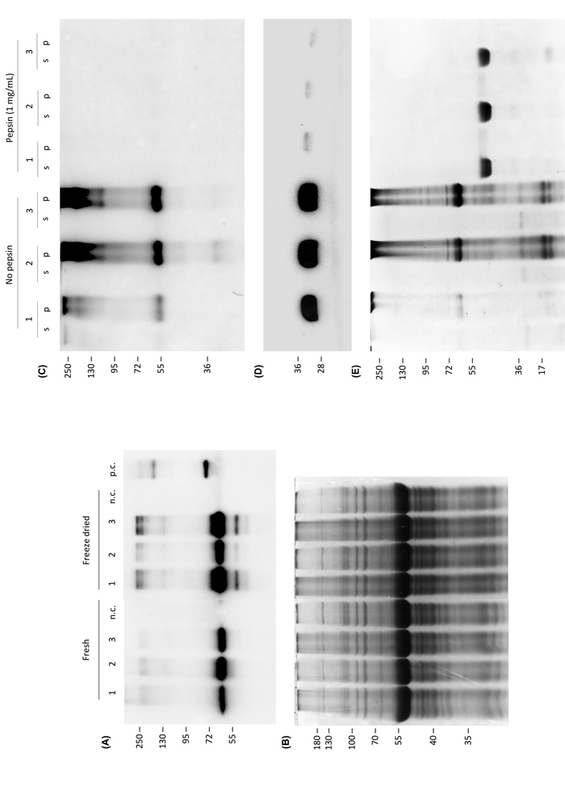 Both digestive treatment conditions resulted in the recombinant protein degradation, as demonstrated by western blot analysis (Figure 3C,D,E, data reported only for the pepsin final concentration of 1 mg/mL). The absence of a specific signal in the pellet samples after pepsin digestion (lanes pepsin, p 1-3), suggested that after freeze-drying treatment, the plant cells lost their integrity, leading to the target protein degradation. The evaluation of cell integrity showed that when dried plant tissue was resuspended in buffer with neutral pH (pH 7.4), ∆87GAD65mut was partially solubilized, suggesting that at least some cells were broken during leaf grinding and drying. The resuspension of dried plant tissue in acidic conditions, instead, led to the detection of the ∆87GAD65mut only in the insoluble fraction. This was probably due to the ∆87GAD65mut precipitation caused by the low pH, in addition to the protein content of unbroken cells11. These assays indicate that freeze drying could be selected as treatment for the preparation of the vaccine candidate. Furthermore, the residual microbial charge in the agroinfiltrated red-beet leaves was evaluated. The bioburden assay displayed that the treatments exploited for the candidate vaccine preparation eliminated the bacterial load11. The metabolic bioequivalence of ∆87GAD65mut and control red beet plants was assessed by fingerprints of primary and secondary metabolites and polar lipids generated by LC-MS from nine red beet plants expressing ∆87GAD65mut, nine agroinfiltrated controls and nine wild-type controls. PCA statistic revealed a wild-type plant cluster separated from all the other samples. No significant differences were instead highlighted between the ∆87GAD65mut and infiltrated and negative control plants. Furthermore, no significant difference among the three groups of plants in terms of polar lipid profiles was identified11. Figure 1: Comparison of eGFP expression levels in agroinfiltrated red beet and spinach leaves. Western blot analysis (A, D) and corresponding loading controls (RuBisCO large subunit) stained with Coomassie Brilliant Blue (B, E) of protein extracts from eGFP-expressing leaf samples collected during the time-course analysis from 4 to 14 days post infection (dpi). The eGFP content of each leaf protein extract was quantified by fluorescence measurement (C, F). The results from agroinfiltrated red-beet leaves samples are displayed in the left panel, where the agroinfiltrated spinach samples are shown in the right one. Equal amounts of protein extracts have been loaded, 3.5 µg for the western blot and 30 µg for the Coomassie staining. An anti-eGFP antibody has been used as a probe in the western blot analysis. Side numbers indicate molecular mass markers in kDa. p.c., positive control, 10 ng of commercial recombinant human GAD65; n.c., negative control, extract from leaves infiltrated solely with A. tumefaciens carrying the 5’- and integrase modules. Error bars represent the standard deviation from three independent experiments. This figure has been modified from Bertini et al.11. Please click here to view a larger version of this figure. Figure 2: GAD65mut and Δ87GAD65mut expression levels in red beet leaves. Western blot analysis (A) and corresponding loading control (RuBisCo large subunit) stained with Coomassie Brilliant Blue (B) of protein extracts from three red beet leaves expressing Δ87GAD65mut (left) and GAD65mut (right). An anti-GAD antibody has been used as a probe in the western blot analysis (the lanes were loaded with 20 μL of extract for GAD65mut and 1 μL of extract for Δ87GAD65mut). In the Coomassie stained gel, the same volume of protein extracts (10 μL/lane) was loaded for GAD65mut and Δ87GAD65mut. Side numbers indicate molecular mass markers in kDa. p.c., positive control, 10 ng of commercial recombinant human GAD65; n.c., negative control, extract obtained from leaves infiltrated only with A. tumefaciens carrying the 5’- and integrase modules. (C) Using the western blot positive control as a reference for a densitometric analysis, the relative expression levels of the two protein forms are plotted. Error bars represent the standard deviation from three independent experiments. This figure has been modified from Bertini et al.11. Please click here to view a larger version of this figure. Figure 3: Oral vaccine candidate evaluation. On the left side, analyses of protein stability after freeze-drying treatment (A, B). Western blot analysis (A) and corresponding gel stained with Coomassie Brilliant Blue (B) representing three independent extracts from leaves expressing Δ87GAD65mut. Harvested leaves were directly frozen (fresh) or lyophilized at -50 °C, 0.04 mbar for 72 h (freeze dried). Different tissue:buffer ratios were employed during the TSP extraction in order to consider the water loss due to dehydration. Equal volume of extracts were loaded, 0.25 and 10 µL, for western blot and Coomassie staining respectively. An anti-GAD antibody has been used for the western blot probing Side numbers indicate molecular mass markers in kDa. n.c., negative control, extract from leaves inﬁltrated solely with A. tumefaciens carrying the 5’- and integrase modules. On the right side, in vitro simulated gastric digestion of Δ87GAD65mut (C,D,E). Western blot analyses (C, D) and corresponding gel stained with Coomassie Brilliant Blue (E) representing three independent extracts of leaves expressing Δ87GAD65mut after simulated gastric digestion. 1 mg/mL of pepsin has been added to 100 mg of lyophilized tissue, while a control sample without enzyme has been used. 24 µL and 16 µL, for supernatants (s) and pellets (p) respectively obtained in the final centrifugation step, have been used for SDS-PAGE analysis. Anti-GAD (C) and anti-LHCB2 (D) antibodies were used as probes in the western blot analysis. Side numbers indicate molecular mass markers in kDa. Please click here to view a larger version of this figure. Table 1: Gradient conditions for metabolite elution in LC-MS analysis. Table 2: Parameters for mass spectra acquisition in alternate positive and negative ionization modes. In this study we showed preliminary analysis for the design of a candidate oral vaccine for autoimmune diabetes. The target protein for this experiment was a mutated form of the human 65 kDa Glutamate Decarboxylase, which production and functionality are easily detectable and measurable12. Its expression in different edible plant tissues was mediated by the vectors5, which mediate a high level of recombinant protein production in a very short time frame. The selection of the best candidate plant edible host was performed based on the eGFP expression in red beet and spinach leaves by manual agroinfiltration. This step could be critical for industrial scale-up because of the time-consuming procedure of manual agroinfiltration and the hardness in spinach leaf tissue infiltration. The identification of the specific dpi of harvesting that gives the highest recombinant protein accumulation level for a recombinant protein is a critical step and need to be tested and selected on a case-by-case basis. The analysis of the fluorescent protein expression at different dpi (from 4 to 12), allowed to identify the day of maximum expression in each plant system. The comparison between the eGFP concentration (µg/g FLW), in these maximum expression days, highlighted that red beet is the best performing platform in terms of recombinant protein yields. For this reason, red beet was further tested for the delivery of plant virus-based vectors by a vacuum system, which is considered more suitable for vaccine industrial large-scale production13. Given that the standard vacuum infiltration protocol is optimized for tobacco species5, the set-up of a range of parameters for the procedure adjustment to the plant species considered is a critical point. Then, the red beet vacuum agroinfiltration protocol was optimized. Our evidence showed that the Agrobacterium dilution is crucial to improve the protein expression levels, while the detergent concentration to enhance the leaf permeability. The results showed that the plant system and the technology fit with this work purpose. Two different forms of GAD65, GAD65mut and ∆87GAD65mut, that were previously characterized for their expression in N. benthamiana7, displaying different sub-cellular localization, were expressed in red beet by vacuum infiltration. Three biological replicates were prepared for every sample. Each biological replicate comprises a pool of three infiltrated leaves from different plants, sampled from 2 to 14 dpi for both the GAD65 forms. Their expression level was compared to select the highest accumulating protein in plant tissues. The relative quantification by densitometry analysis demonstrated that the ∆87GAD65mut has a 20-fold higher expression level than its intact counterpart. This could be due to its cytosolic localization whilst GAD65mut, due to its residues that anchor this form to the cell membrane, has a lower yield7, reflecting a lower protein stability. ∆87GAD65mut average accumulation level in red beet leaf tissue was 201.4 ± 29.3 µg/g FLW, which is sufficient to start with the T1D oral vaccine development. Finally, after the selection of the most suitable platform, technology and protein form, we proceeded by setting up a post-harvest treatment of the infected leaves. Since leaf tissue is composed of 95% of water, a dehydration treatment is useful to prevent microorganism contamination. Our results demonstrated that a freeze-drying treatment could be applied to the sample, without affecting the recombinant protein levels in the leaves. The 10-fold water removal by lyophilization eliminates the bacterial contamination (bioburden), including the recombinant A. tumefaciens used for the agroinfiltration procedure. Furthermore, the analysis of protein bio encapsulation showed that the ∆87GAD65mut is completely digested following a simulated gastric digestion. This suggests that the freeze-drying treatment damages the plant cell wall, exposing the recombinant protein to the acidic and enzymatic composition of the gastric environment. The maintenance of the protein or peptide molecule integrity over the gastrointestinal tract transition to the site of absorption represents an issue for oral drug delivery14. Hence, after dehydration treatment, the potential vaccine should be correctly formulated to overcome the gastric environment without losing its integrity. In the manufacture of the plant-derived GAD vaccine, the encapsulation in a relatively stable shell could be applied as a system to improve its efficiency allowing it to be protected and stable along the oral delivery route15. Various technologies have been explored to overcome the problems associated with the oral delivery of macromolecules such as some recent studies on complexation of synthetic hydrogel with insulin which showed a high encapsulation efficiency and rapid insulin release in the intestine in a pH-dependent manner16,17. Both the primary and secondary metabolite bioequivalence of plants expressing ∆87GAD65mut in comparison to infiltrated and non-infiltrated controls was investigated using PCA statistics. The differences between the infiltrated plants expressing ∆87GAD65mut and the infiltrated controls were not significant, whereas the non-infiltrated wild-type plants formed a separate cluster. These results suggest that the infiltrated plants are distinguished from untreated plants by the LC-MS analysis thanks to bacterial metabolites or metabolites produced by plants because of the infiltration, as already shown in literature13. Overall this analysis demonstrated that the accumulation of ∆87GAD65mut has little impact on the overall metabolism. Altogether these results suggest that the potential oral vaccine, represented by freeze-dried red beet leaf tissue expressing ∆87GAD65mut obtained exploiting the plant virus-based expression technology, is suitable for experimental T1D oral immunotherapy trials. The plant virus expression vector technology has become very attractive in the transient expression field, due to its ability to produce foreign proteins both rapidly and at high levels. This technology is based on a deconstructed vector that carries only the RNA polymerase RNA dependent and movement protein5 and therefore it loses its infectivity in plants; as a consequence, its potential transmission to humans should be excluded. The experimental protocol reported here could be extended to many different edible species, such as lettuce, Chenopodium capitatum and Tetragonia expansa. Since the leaves of these species, including red beet and spinach, whose was previously detected as good expression plant systems5, can be used as uncooked food, the technology proposed here might be used for manufacturing edible vaccines or for production of minimally processed functional food or feed. The combination of recombinant protein/plant species, dpi of harvesting that gives the highest recombinant protein accumulation level need still to be determined empirically on a case by-case basis depending on the recombinant protein expressed and on the host plant species18. The application of this technology for the production of oral vaccine hold great potential to become an alternative to conventional vaccines in the near future, in addition to combat oncolytic viruses, autologous vaccines for lymphomas and solid tumors, and monoclonal antibodies to target cancers19,20. This work was supported by the Joint Project “The use of plants for the production of an autoimmune diabetes edible vaccine (eDIVA)” (Project ID: 891854) funded by the University of Verona in the framework of the call 2014. Merlin, M., Pezzotti, M., Avesani, L. Edible plants for oral delivery of biopharmaceuticals. British Journal of Clinical Pharmacology. 83, (1), 71-81 (2017). Merlin, M., Gecchele, E., Capaldi, S., Pezzotti, M., Avesani, L. Comparative evaluation of recombinant protein production in different biofactories: The green perspective. BioMed Research International. (2014). Menkhaus, T. J., Bai, Y., Zhang, C., Nikolov, Z. L., Glatz, C. E. Considerations for the recovery of recombinant proteins from plants. Biotechnology Progress. 20, (4), 1001-1014 (2004). Avesani, L., Bortesi, L., Santi, L., Falorni, A., Pezzotti, M. Plant-made pharmaceuticals for the prevention and treatment of autoimmune diseases: Where are we? Expert Review of Vaccines. 9, (8), 957 (2010). Marillonnet, S., Thoeringer, C., Kandzia, R., Klimyuk, V., Gleba, Y. Systemic Agrobacterium tumefaciens-mediated transfection of viral replicons for efficient transient expression in plants. Nature Biotechnology. 23, (2005). Ludvigsson, J. Update on treatment of type 1 diabetes in childhood. Current Pediatric Reviews. 1, (2), 118-127 (2013). Merlin, M., et al. Enhanced GAD65 production in plants using the MagnICON transient expression system: Optimization of upstream production and downstream processing. Biotechnology Journal. 11, (4), 542-553 (2016). 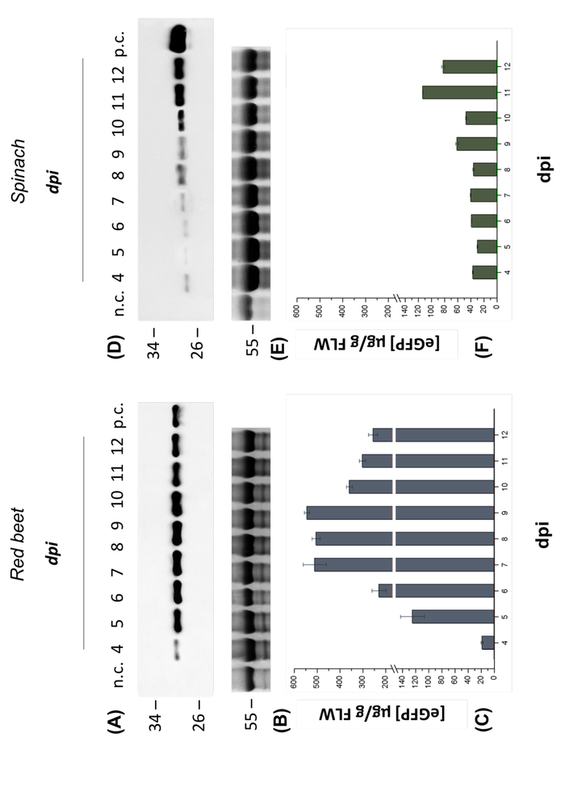 Gecchele, E., Merlin, M., Brozzetti, A., Falorni, A., Pezzotti, M., Avesani, L. A Comparative Analysis of Recombinant Protein Expression in Different Biofactories: Bacteria, Insect Cells and Plant Systems. Journal of Visualized Experiments. 23, (97), (2015). Dal Santo, S., et al. The terroir concept interpreted through grape berry metabolomics and transcriptomics. Journal of Visualized Experiments. 5, (116), (2016). Chen, Q., et al. Agroinfiltration as an effective and scalable strategy of gene delivery for production of pharmaceutical proteins. Advanced Techniques in Biology and Medicine. 1, (1), (2013). Bertini, E., et al. Design of a type-1 diabetes vaccine candidate using edible plants expressing a major autoantigen. Frontiers in Plant Science. 9, Article 572 (2018). Avesani, L., et al. Improved in planta expression of the human islet autoantigen glutamic acid decarboxylase (GAD65). Transgenic Research. 12, (2), 203-212 (2003). Sepúlveda-Jiménez, G., Rueda-Benítez, P., Porta, H., Rocha-Sosa, M. A red beet (Beta vulgaris) UDP-glucosyltransferase gene induced by wounding, bacterial infiltration and oxidative stress. Journal of Experimental Botany. 56, jxb/eri036 (2005). Renukuntla, J., Vadlapudi, A. D., Patel, A., Boddu, S. H. S., Mitra, A. Approaches for enhancing oral bioavailability of peptides and proteins. International Journal of Pharmaceutics. 447, 75-93 (2013). Mustafa, A. Z. Encapsulation importance in pharmaceutical area, how it is done and issues about herbal extraction. Available from: https://www.researchgate.net/publication/271702091_Encapsulation_importance_in_pharmaceutical_area_how_it_is_done_and_issues_about_herbal_extraction (2015). Kamei, N., et al. Complexation hydrogels for intestinal delivery of interferon beta and calcitonin. Journal of Controlled Release. 134, 98-102 (2009). Tuesca, A., et al. Complexation hydrogels for oral insulin delivery: effects of polymer dosing on in vivo efficacy. Journal of Pharmaceutical Sciences. 97, 2607-2618 (2008). Twyman, R. M., Schillberg, S., Fischer, R. Optimizing the yield of recombinant pharmaceutical proteins in plants. Current Pharmaceutical Design. 19, 5486-5494 (2013). Dhama, K., et al. Plant-based oral vaccines for human and animal pathogens – a new era of prophylaxis: current and future perspectives. Journal of Experimental Biology and Agricultural Sciences. 447, (0), 75-93 (2013). Hefferon, K. Reconceptualizing cancer immunotherapy based on plant production systems. Future science. O3, FSO217 (2017).